Parking: Free parking available at the address above. Finding the parking lot is tricky, and you will lose reception a couple miles before you get there. I would recommend Google Mapping the address beforehand and printing out the directions below (Apple maps gives the incorrect place). If you do not have a truck or SUV, be prepared to drive slowly for 4 miles on a rocky dirt road. My Honda Civic was fine but it was still tricky to get there. CAUTION: This trail can get very hot in summer. 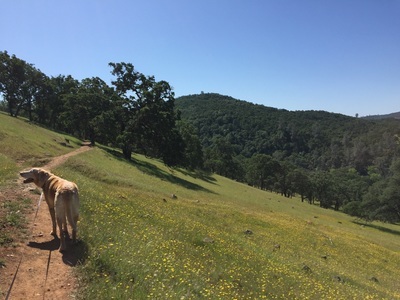 I would not recommend hiking it in summer, as there is no shade or water for miles and the dirt trails become very hot for paws. You don’t want to risk your dog getting heat stroke or burning its paws. Description: After a moderate hike, you will be rewarded with a beautiful waterfall, which had a great flow even in mid-April. There are even swimming holes when you reach the waterfall. The loop to the waterfall and back is about 5 miles round trip. Go early because the falls area isn't that large and it gets crowded. The trail to the falls is not very scenic- a wide dry dirt trail with minimal shade. 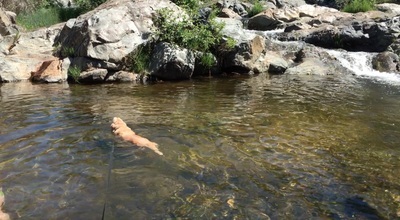 Part of it follows the creek. I saw a few hunters (even though they're not supposed to hunt in April), but they mostly stayed on the trails in the hills. 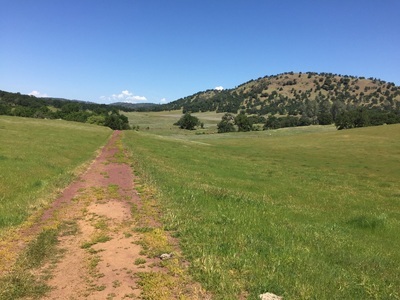 As you get about 1.5 miles from the falls it opens up to a large grass meadow with wildflowers and a view of the hills. The top of the falls is beautiful. There are lots of great spots to take a break along the water. I went around 10am and there were less than 10 parked cars and a few groups of people at the falls, but it wasn't too crowded. On my hike back in the afternoon I passed a lot of people and the cars overflowed from the parking lot and lined the street. 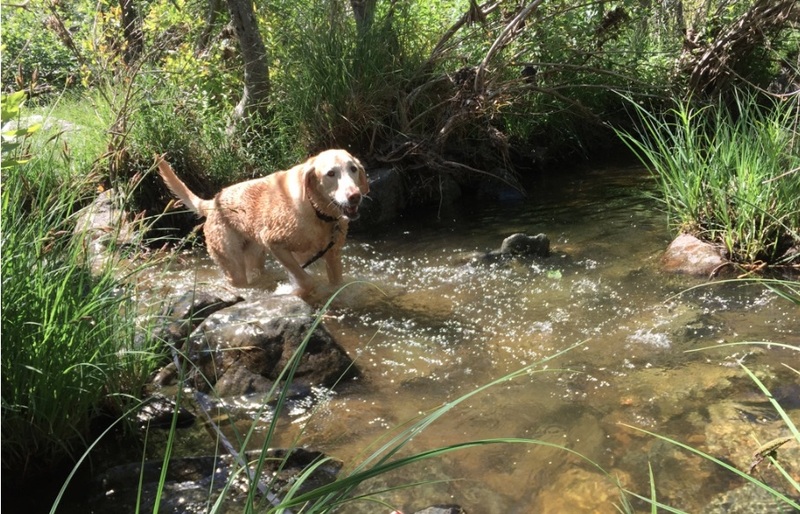 If you want to keep hiking on your way back, there's a good sized lake in the hills (the first gate on your left after the parking lot, just follow the trail along the creek and up). There were a couple people fishing there but it was shaded and peaceful. Hiking directions: From the yellow gate at the parking lot, cross the bridge and turn right (you will see a "falls" arrow sign). Stay on the wide dirt path for a while until you see a white gate that tells you to turn right for the falls. Turn right and you will go through a small gate. Follow the dirt path up, across a cattle grate, and you will see another sign indicating that the upper falls is .9 mile to the left and the lower falls is 1 mile right. Take the upper trail and see the top because you can't get a good view of the falls from down below. 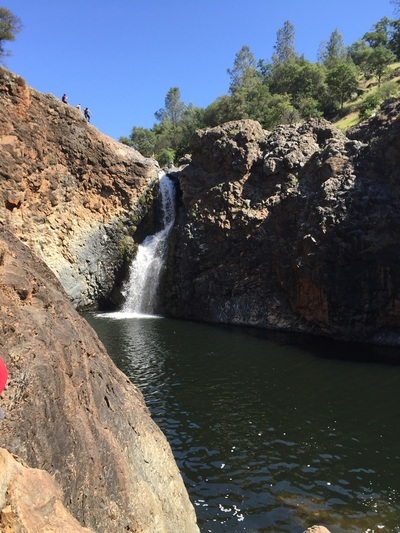 It's tricky to get down to the large pool at the base of the falls because of huge boulders. Most dogs won't be able to make it down. 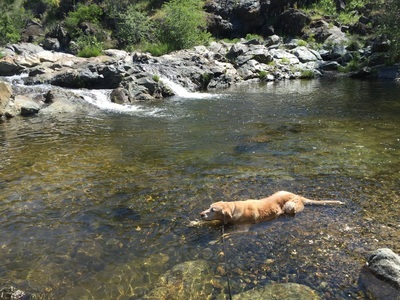 Hike downstream along the water and you and your dog can spend some time relaxing in the pools at the bottom. Take the easy lower trail back, then continue the way you came at the split. Driving directions: From Hwy 20, turn right on Smartville Road, then turn left on Chuck Yeager Road. A sign says something about "gate-for Beale Air Force personnel only" (ignore it). Follow Smartville Road 4.5 miles and turn left off the pavement onto the gravel Waldo Road. You will pass a shooting range on your left within a half mile. You will go over a paved stretch and at just about two miles you cross the wooden Waldo Bridge. Then you're back on a gravel road- stay left on Spenceville Rd. Follow it about 2 miles (almost to the end) and you will see a large dirt lot on your left. Park here and the trail head starts at the yellow gate. 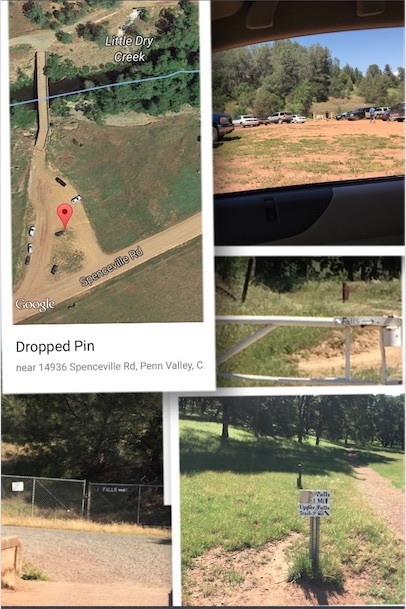 The below compilation of 5 pictures shows an aerial view of the parking lot, a picture of the trail head from my car window (yellow gate), and the signs you will encounter. These pictures are of the first (brown) and second (white gate) signs indicating the direction to the falls, and the last sign showing the routes to the upper and lower trails.